After administration of a paramagnetic contrast agent, the resonance frequency of the vessels shifts in a geometry-dependent way. This frequency change has recently been exploited for angiographic contrast generation ('ORCA') by Edelman . However, this contrast enhancement was shown to depend on the angle Θ of the vessel relative to the magnetic field. IRON provides an alternative off-resonance contrast enhancement technique . It is hypothesized that IRON-MRA is less dependent on Θ, because only a narrow band in the frequency domain is attenuated, and because concomitant T1-lowering by the contrast is exploited. To address this hypothesis, the relative contribution of off-resonance and T1-lowering to the contrast enhancement in IRON-MRA was investigated in vitro and in vivo at 3 T.
To measure the relative contribution of off-resonance to the contrast enhancement in IRON-MRA after iron-oxide nanoparticles adnministration. To study the effect of Θ in vitro, a rod-shaped phantom with 1.6 mM MION-47 (a prototype 30 nm iron oxide nanoparticle, CMIR/MGH) in rabbit blood was placed at different angles to the field. IRON imaging (αIRON = 100°, BWIRON = 107 Hz, 70 bpm triggered segmented gradient echo, TR/TE/α = 3.5 ms/1.4 ms/15°, 19 profiles per shot) was performed while the center frequency of the pre-pulse varied from -500 Hz to 500 Hz. 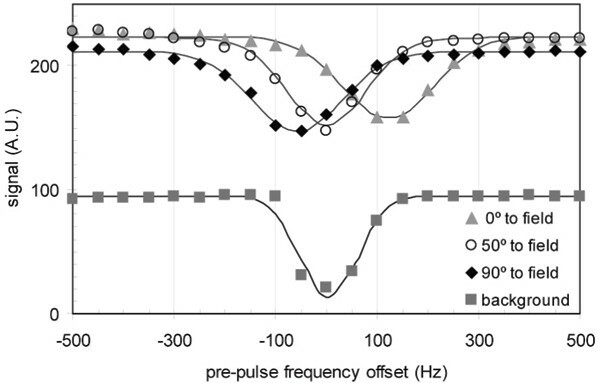 To quantify the off-resonance in vivo, a range of pre-pulse bandwidths (107–1700 Hz) was applied in IRON-MRA of a rabbit aorta after MION-47 (1 mM). From the blood signals and an estimate of T1, the relative contribution of off-resonance to the total signal was quantified. For visual comparison, a regular T1-MRA (TR/TE/α = 25 ms/2.6 ms/20°) was obtained. In Figure 1, the signal intensities as a function of the center frequency of the pre-pulse are shown for different angles Θ of the phantom. Maximum signal attenuation for each curve is obtained when the frequency of the IRON pre-pulse matches that of the blood. As shown in Figure 1 and consistent with the theory, the frequency for which maximum signal attenuation occurs depends on Θ. Note that none of the curves show a 100% attenuation, which is attributable to T1-recovery between the pre-pulse and acquisition. Signal in the phantom and background as a function of the offset frequency of the IRON pre-pulse for three different angles of the phantom rod relative to the main magnetic field. 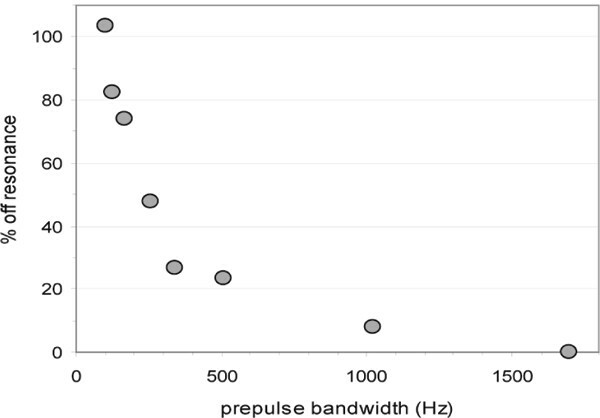 In Figure 2 the relative contribution of the off-resonance component of the signal is shown as a function of the pre-pulse bandwidth in the rabbit experiment. MIPs from a regular T1 MRA, as well as a large and small bandwidth IRON-MRA are shown in Figure 3. The relative contribution from off-resonant spins (which are not affected by the saturation pre-pulse) to the total vascular signal in a rabbit aorta IRON-MRA. MIPs of three MRAs of a MION enhanced rabbit aorta: (a) regular T1-MRA, (b) IRON-MRA with a large (1700 Hz) and (c) with a small IRON pre-pulse bandwidth (107 Hz). With an on-resonant pre-pulse, the 0 and 90 degree blood curves (Figure 1) are not at their respective minimum, demonstrating relative signal conservation due to off-resonance, while the background signal is effectively suppressed. The feasibility of the exploitation of this effect in vivo is shown in Figure 2, where suppression with relatively small bandwidths yields substantial off-resonance components to the total signal. While ORCA utilizes off-resonance excitation, thereby imaging the positive frequency shifts only, IRON-MRA uses a narrow-bandwidth on-resonant frequency selective magnetization preparation. Not only do both ends of the frequency spectrum contribute to the signal, but simultaneously, the inherent T1 shortening of the contrast agent is used, which yields additional MRA contrast irrespective of Θ (aorta still visible in Figure 3b). The relative contribution of the off-resonant signal is also apparent by visually comparing Figure 3b and 3c. The signal formation of IRON-MRA is partly the result of the susceptibility induced spectral shift after iron-oxide nanoparticle injection. The relative contribution of this off-resonance effect has been characterized in vitro and in vivo. While the off-resonance contrast depends on the angle between the blood-sample and the magnetic field, this angular dependent signal-attenuation was found to be relatively small, which is attributable to the shortened T1.